Hope for Casa Alegria: OPERATION CHRISTMAS STOCKING! The Dream Has Become A Reality!! Our first mission group consisted of five people from our church. We hope to grow in numbers with each future trip. It is certainly a life changing experience, and being a member of our church is not a prerequisite. July 2010 trip is now full! What a wonderful success! A few months ago, plans were put into place to send each of the children at Casa Alegria a Christmas stocking. The Sunday night children's group started bringing in donations as did several people at church. We sewed and personalized 131 stockings and had a few extras. Each one had a Beanie Baby (thanks Jay), a box of crayons and a coloring book. Then there were things like socks, bubbles, candy, small toys and bracelets added in for the older children. For the baby's, there were pacifiers, rattles, onesies and baby blankets. The kids group had a great time stuffing all of the stockings. All in all, there were six suitcases full of items that were taken down just before Thanksgiving. Just a sample of the stockings laying out to let the names dry. The finished products. What a fun night! On Christmas eve, we got a big surprise! A couple of our friends in Guatemala City e-mailed us to let us know that they were reading the news paper and saw an article about the children in Casa Alegria receiving "boots" for their Christmas celebration. Our Christmas Stockings made the Presna Libre news paper and so did the beautiful children who received them! What a blessed Christmas gift for us to see the children actually receiving their stockings! Plans are in the works for our next mission trip to Guatemala. We are planning on going July 23 through the 28th. As of now, we are hoping to spend some time at a small Christian School near Antigua. We hope to take them some supplies and will be making ourselves available for any maintenance type work that needs to be done. Then we will be going back to Guatemala City to take the children of Casa Alegria to the zoo. When we went down to take the stockings, the director of Casa Alegria told us they will be moving to a new facility soon. She wasn't sure when and she wasn't sure if they would need any kind of maintenance type work done so we will wait until a little closer to time to see how we will best be able to help them on this trip. If you would like to join us, keep those dates open, get your passport (and your hepatitis A vaccine) and watch for further updates. I'm getting excited already! we are currently in guatemala and visited casa alegria yesterday. 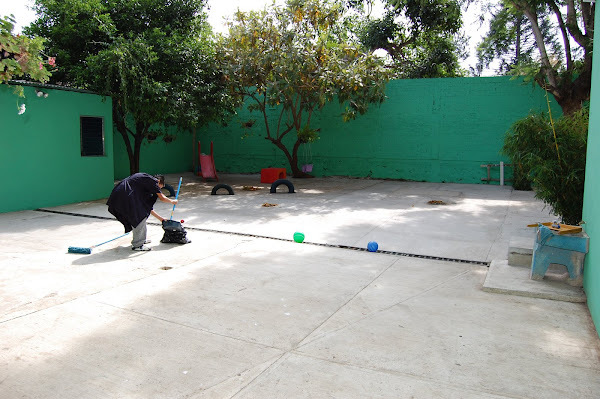 we share your concerns about the hogar and the children. is there anything that we can do for you guys while we are here? You've inspired us. We'd like to gather all our friends to host an Easter basket stuffing party. Can someone (Pam?) contact me to let me know who to contact at Alegria re: #s of kids, etc? We travel to Guatemala somewhat regularly and would be happy to bring the baskets down vs shipping them.